over the deep blue sea!" The illustrator of this book, Oscar Seaworthy (oh yes! 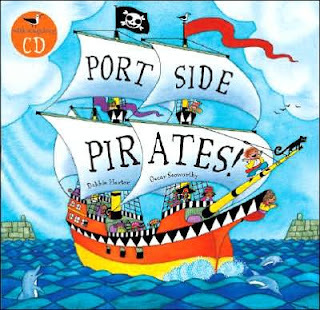 ), keeps the pirates cartoonish and friendly, and yet it still has the trademark Barefoot Book look to it. I think it feels very folksy. They definitely have a unique look and feel to their books on the whole and this book sticks to Barefoot tradition (i.e., bold colors, inviting illustrations, etc.). The pirates in this book run into a storm, come upon a deserted island, and find treasure, just like all good pirates do. It's an upbeat kind of book and so I don't really mind indulging in the obsession with this book. 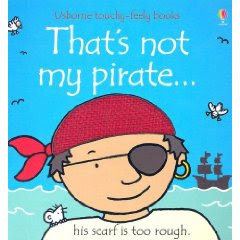 The other pirate-y book that my son loves is Usbourne Books' That's Not My Pirate which is BABY friendly so I really have no worries about it. 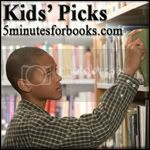 We reviewed this book previously on 5 Minutes for Books and its still a favorite in our household. 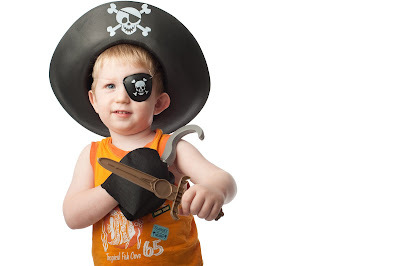 Pretty much all you are doing is looking at various pirates and feeling different textures. Technically this is below my son's reading level but it is not below his interest level. 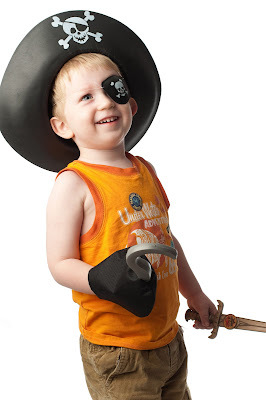 (Again, we're talking about eye patches, telescopes and pirate ships, etc. It's really hard to go wrong with this book.) A clever little addition to Usbourne's line of That's Not My . . . series. "Barrels of fun for everyone!" Yeah, with the "real pirates" being in the news of late, I can't help but wonder when they won't be politically correct anymore!! I loved pirates when I was younger. Thanks for visiting today! We also LOVE "How I Became a Pirate" by Melinda Long (and illustrated by the very recognizable David Shannon)-- the focus is on the 'freedom' the pirates have, from the perspective of a five year old boy-- no one to tell them to brush their teeth or eat their veggies, etc. It's all in good fun, with a fun ending, and it's a FANTASTIC read aloud!! Thanks for sharing the pictures, especially, Carrie! I wish we lived closer so you could photograph my girls! Those books look like a lot of fun!